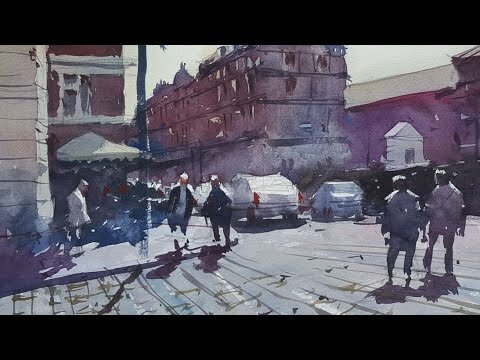 Watercolour demonstration by Tim Wilmot with people, buildings and cars. This is a 3 colour painting – I am only using Red (Rose Opera), Yellow (Yellow Light) and Blue (Cinereous Blue). Sorry, and a Neutral Tint for darks. 1) Choice of Subject. What makes a good watercolour subject. How to simplify the scene. 2) Materials I use such as the paper. I will also cover the paints I use and the palette, plus how I hold the different brushes for different techniques. 3) Doing the outline sketch as the first step. How to draw boat shapes. 4) Doing the sky and the first wash of the background and then the foreground. 5) Shadows and details of the figures and cars. 6) Watch out for the 'sword' brush at the end and highlighting tips. 7) Using those 3 colours to get most colours you want!